I want a borehole on my property as a source of drinking water, irrigation water or for industrial use, what should I do? Is the water in my tap groundwater? There are two issues here - will a borehole provide the quantity of water you need, and will the quality be adequate for your purpose. 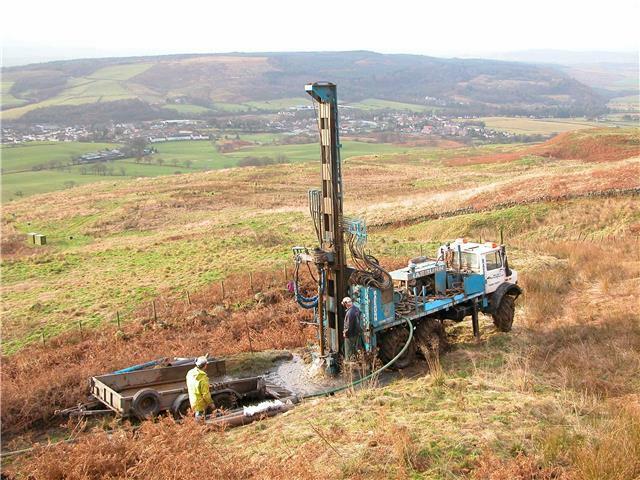 In England, Wales and Scotland, the British Geological Survey can, for a fee, prepare a Water Borehole Prognosis Report for the site, based on geological and hydrogeological maps and the information available to them in their borehole database. In Northern Ireland, the Geological Survey of Northern Ireland should be contacted first for advice on the likely success of a borehole on your property and for general advice on the local issues associated with the commission of a new borehole water supply. Hydrogeological consultancies will also provide this service. Contact details for these can be obtained through the Geologist's Directory produced by the Geological Society or perhaps the local office of your environment regulator. Drilling contractors with knowledge of local conditions may also be able to provide advice. It is a good idea to employ a consulting hydrogeologist to manage the process of installing a borehole to provide a good quality water supply to your property. They can make informed decisions that are important to the final quantity and quality of water produced by a borehole. These decisions include where to site a borehole, what design it should have, how to construct it and what driller it would be best to use. Just like if you were building a new house, you would employ an architect to design and manage the construction of the new house so that it will meet your needs, a consulting hydrogeologist will ensure that the installation of a borehole is designed and constructed with your needs in mind. If it looks like you can get the quantity and quality of water you need then consent to drill and test pump an exploratory borehole must be sought. In England and Wales approach the Environment Agency. In Scotland an authorisation is required from the Scottish Environment Protection Agency (SEPA); here there will be a tiered approach - authorisation will be in the form of notification, general binding rules and licences. In Northern Ireland, you should approach the Geological Survey of Northern Ireland prior to drilling a borehole to receive up to date advice on any consents that may be required. Further information on the construction of boreholes can be obtained from various information booklets available to download on the Environment Agency website including Searching for Groundwater, which outlines the procedure for gaining consent in England and Wales. Contact details for drillers can be obtained by contacting the Well Drillers Association. Their web site contains useful information on the construction of boreholes for water supply. Booklets on the construction of water supply boreholes and their headworks have been produced by the Environment Agency and the Scottish Environment Protection Agency. The Institute of Geologists of Ireland have published a useful set of guidance documents for domestic property owners considering a borehole on their property. These documents use non technical language to help inform property owners about the process and principles of drilling a borehole. Please note, there is a legal obligation for the driller to send information on the construction of boreholes drilled for water, deeper than 15 metres, to the British Geological Survey. In Northern Ireland there is a legal obligation for you to send such information to the Geological Survey of Northern Ireland and not the driller. A consultant hydrogeologist will produce a completion report for you and this will include all the information that the surveys require. You should send a copy of your completion report to the Geological Survey of Northern Ireland. The Surveys are keen to have information on shallower boreholes as well. In England and Wales, your first step should be to contact your local office of the Environment Agency to find out whether you will need to apply for a licence, particularly as licensing regulations have recently changed. They will also provide general details about how to go about obtaining a licence. 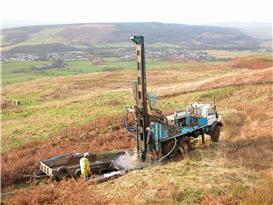 The need for a licence for a borehole in England and Wales is dependent on how much you intend to pump. If you are planning to pump more than 20 m3/day you will almost certainly require a licence. In some areas groundwater resources may already be fully utilised and there may be restrictions on where and how much additional water can be pumped. In Scotland, an authorisation for groundwater abstraction is required. More information can be obtained from your local office of the Scottish Environment Protection Agency. Water abstraction control regulations were introduced in Northern Ireland in 2007. A license is not required for abstractions from a single supply point that on average abstract less than 20 cubic metres of water per day (20,000 litres). An average domestic household has a normal daily demand of 1 cubic metre of water per day (1,000 litres) and a license is therefore generally not required for a borehole abstraction for a single domestic household supply. Contact the Northern Ireland Environment Agency for more details. In England and Wales, if your borehole supply is licensed, then it will already be registered with the Environment Agency. If your abstraction is unlicensed then there is an advantage in telling the Environment Agency as the presence of groundwater sources is an important consideration in many of the day to day water management and protection duties they undertake. In Scotland all abstractions need to obtain an authorisation. Therefore there is no separate need to inform SEPA. In Northern Ireland, it is recommended that you notify the Northern Ireland Environment Agency of new supply boreholes to help with groundwater protection. In England, Wales and Scotland, if your borehole supplies water for domestic use, or to make food or drink that will be sold, then the Environmental Health Department of your Local Authority has an obligation to test the water. The minimum statutory monitoring may be done free of charge. A more frequent monitoring service, if not free, will often be done at cost price. Although you are not obliged to tell your local authority that you have a private supply, it is advisable to do so, as they can advise you of any potential pollution risks. For sources to be used for domestic purposes for more than one household, or for commercial food production for human consumption you should contact your Local Authority. In Northern Ireland, you are advised to contact the Drinking Water Inspectorate, a unit within the Northern Ireland Environment Agency. It is a good idea to inform your local councils Environmental Health Department of any new supply borehole.